This Fall we’re riding Flax Fixed, a crazy BMX frankenbike, and this Scott Addict SL. 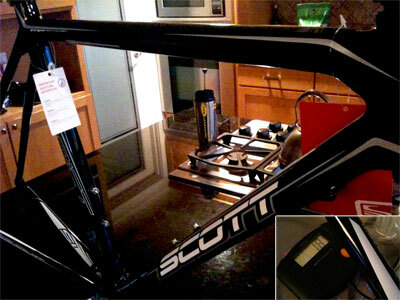 The Scott is our weight weenie bike, with the frame tipping the scales at 1.8 pounds*. According to Scott, the Addict is the lightest production frameset and it’s noticeably light in your hands. Like wow light. Carbon racing frames in this class hover around 2 pounds plus a bag of chips. The Scott drops another 1/2 pound by removing carbon weave and all the frame bits are carbon: dropouts, cable guides. The biggest difference is that Scott is using a high-modulus carbon, which means they can build the frame with less material. Also build it stiff as f*ck. I rode a Scott R2 earlier this year in Greenville. Oh and we’ve got a Jake the Snake in the queue, as well as a Single Speed Tricross. *Weighed on a postage scale.